Overview of Adaptations raised beds. The Adaptations CSA operation has been farming and providing locally grown organic produce to chefs and families since 1984. Owners Tane and Maureen Datta’s operation combines produce grown on their Adaptations Farm while also acting as a distribution center for produce and fruits grown by over 100 other organic farms all around Hawai’i Island. The 7.5 acre certified organic farm at 1,500 foot elevation in Honaunau, South Kona, has been in operation for 15 years growing micro mix, edible flowers, herbs, salad greens, avocadoes and medicinal plants -- and experimenting with crops not usually seen on the island. 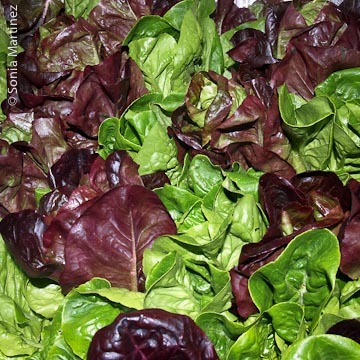 Red and green baby romaine lettuce. The farming methods are varied but all are certified organic practices. Maureen and Tane use different techniques such as traditional, greenhouse, and raised beds, using only biocrumbles and neem mulch for addition to their compost. They also have an active training program to teach aspiring gardeners how to farm successfully, as well as hosting select volunteers through the “World Wide Opportunities on Organic Farms”, also known as ‘WWOOFers’. 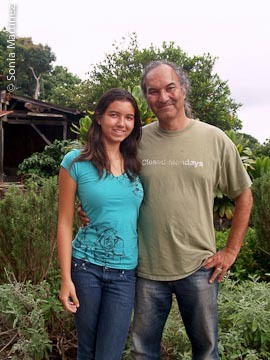 Tane is a founding member of Hawai‘i Organic Farmers Association (HOFA) and a contributor to the Organic Materials Review Institute (OMRI), Independent Organic Inspectors Association, and Oregon Tilth, as well as a contributing writer to the Hawai‘i Homegrown Food Network. Maureen worked as assistant to the president of Wildwood Natural Foods in California where she learned skills that served to help expand their own operation. Adaptations has grown from its 1984 start as a small company representing three growers and supplying a handful of subscribers, to the larger operation existing today. Tane Datta with daughter Saffron. The CSA has individual subscribers as well as several executive accounts on five islands. Distribution is conducted from a central warehouse in Kealakekua that is equipped with a large walk-in refrigerator, where the supplier farms drop off their produce. Subscribers’ bags are packed on Monday afternoons. Accounts to be shipped to neighbor islands leave Tuesday morning. Individual subscribers’ bags are dropped off Tuesday at several ‘pick-up’ locations from South Kona to Waimea. On the day of our visit the ‘Basic’ bags contained a pineapple, cucumbers, carrots, green beans, lettuce and tomatoes. The ‘Gourmet’ bags contained all of the previously listed, plus other lettuces, star apples and Ali’i mushrooms. On other weeks the bags might contain seasonal fruits, sweet potatoes, pea shoots, kale, herbs, cabbage, cress, onions, pumpkins and much more, depending on the season and what is available. 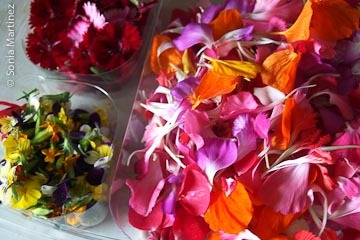 Several accounts order edible flowers which are packed in separate clear clam shells. Adaptations CSA is planning to increase the size and scope of its offerings and expects to be able to give a significant discount when the expansion occurs to subscribers who sign up within the next month. Advertising so far has all been by word of mouth from satisfied subscribers. Subscribers who refer friends receive a $10 credit towards the next subscription each time. South Kona: Adaptations Kealakekua Warehouse - Available T,T, or F from 8 am to 4 pm. Kailua-Kona: Windermere Realty - Available Tue. 10 am to 5 pm in A/C room. North Kona: Hawaii Forest & Trail - Available Tue. 10:30 am to 6 pm in A/C room. Waimea: Tropical Dreams on Lalamilo Farm Rd - Available Tue 1 pm to 4:30 pm in chillroom.